or that’s what my boss calls them. A love refugee is a person from another country who has moved here because of a significant other. Swedes seem to be quite sneaky in this area – they travel overseas with their liberal notions and symmetrical Nordic features, and they trick their admirers into moving back with them to the icy tundra. That is the only explanation I can come up with as to why any foreigner would live in a land that is freezing and dark for nine months of the year. OK, that’s not always how I feel, but the 3:30 sundowns are getting to me. As is the cold. I grew up in the Middle East, spending five years in Muscat, Oman,where it is currently 26C (78F). Yes, I looked it up. I then lived in Lubbock, and L.A, where the temperatures are currently in the low 70’s. On the positive side of things, the past few weeks have been quite entertaining. One of my students asked me what a “minion” was. Apparently Blaire uses it on Gossip Girl, and my student was confused as to its meaning. Probably the oddest word I’ve ever attempted to explain. It it had been a native speaker, I would have stumbled through something about “humorous, derogative word for servant…like underling, lackey…” I had to get a little more creative, but I’ll spare you the details. A couple days ago I was at Plattan, a plaza in the center of Stockholm where they often have events (protests, concerts, etc. 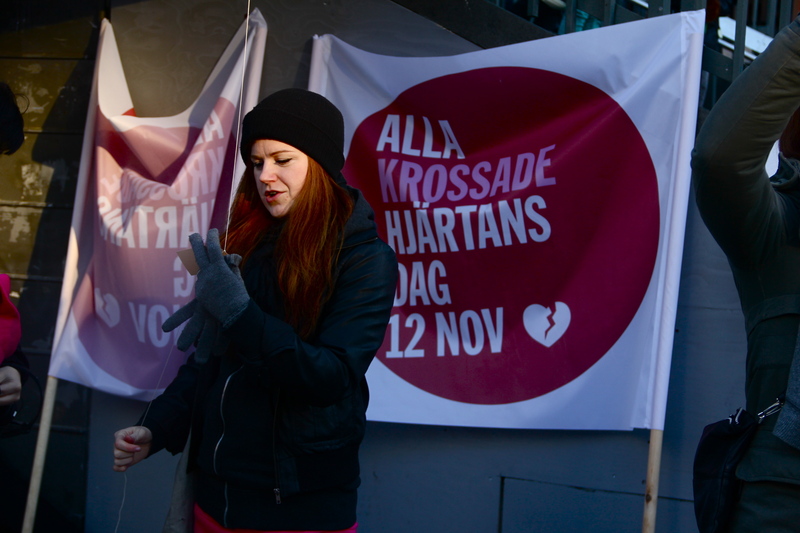 ), and stumbled into a group of people clutching white helium balloons celebrating “Alla Krossade Hjärtans Dag.” Literally translated, this means “All crushed Valentine’s Day.” Basically, a day to join in solidarity with other broken-hearted people. This isn’t a traditional Swedish holiday (from what I can gather), but I thought it was heartfelt idea. I and my companions (three girls I was babysitting) were given free balloons, and we went over to a table to write a little card to the person who had broken our hearts. Then, at one, the crowd simultaneously released the balloons and gazed skywards as they floated into the vast blue. It was quite a touching experience. I found it amusing that one of the girls – a 12 year old – I was with had written a note and released it with her balloon. “Who broke your heart?” I teased her. are you a love refugee too? maybe not in the sense you described but in the sense that it’s kept you there this long? 🙂 always love reading your posts, bhannie! sooo good–keep it up!